Digital company INE Entertainment said in a statement Monday that they fired a journalist who tweeted a horrible message against the Covington Catholic High School students who were being smeared by the media. "We were surprised and upset to see the inflammatory and offensive rhetoric used on Erik Abriss' Twitter account this weekend. He worked with the company in our post-production department and never as a writer," the company said to TheWrap. "While we appreciated his work," they added, "it is clear that he is no longer aligned with our company's core values of respect and tolerance. Therefore, as of January 21, 2019, we have severed ties with Abriss." 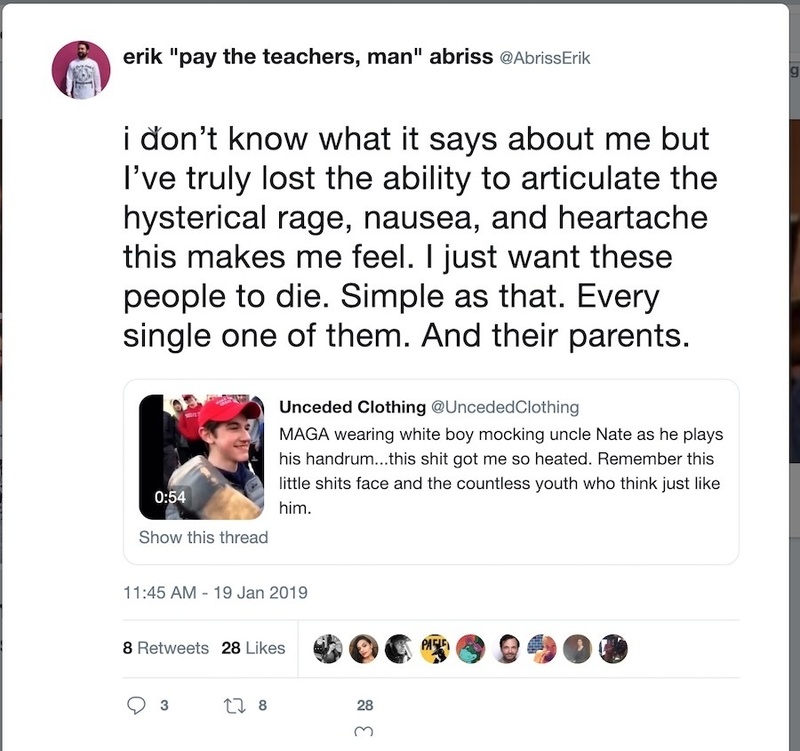 Abriss, who also writes for the pop culture website Vulture, had posted a very inflammatory tweet calling for the death of all the students and their parents. "I don't know what it says about me but I've truly lost the ability to articulate the hysterical rage, nausea, and heartache this makes me feel," Abriss tweeted. "I just want these people to die," he added. "Simple as that. Every single one of them. And their parents." Abriss has since made his account private so only his followers can read his tweets. But the offensive tweet was archived online. "Look at the s**t-eating grins on all those young white slugs' faces. Just perverse pleasure at wielding a false dominion they've been taught their whole life was their divine right. F**king die," he said in a follow up tweet. Vulture declined to comment about the tweets from Abriss. The Covington Catholic High School students were excoriated by many in the media over a misleading video that appeared to show them mocking a Native American protester. As more videos came out about the interaction, it became clear that the students were being smeared by those who wanted to criticize them over their support of President Donald Trump.